by Jake Triola I had a high school calculus teacher who sometimes talked about the dreams she had as a girl to work for NASA. She always seemed to be one of those people who could do just about anything with aplomb; this is obviously due to a combination of natural ability and, focus. She picked something, be it math or music or teaching, and focused on it intensely so she could do it to the best of her ability. This quality was shown in every class. She was even talented at waking up a rather less-than-enthusiastic student who would doze off here and there (not me). Hidden Figures is the perfect film to highlight said quality. From the beginning, you see each of the three main characters being wholly themselves, fiercely focused on who they are and what they strive to become. As three black women employed by NASA in the ’60s, the protagonists certainly have a leg up, but they didn’t come this far to come up short. Not one of these characters has a straight shot to success. They must play the white man’s game and face extraordinary adversity while doing so. Katherine Goble (Taraji P. Henson) is even looked down upon by a man of color in the form of U.S. Army officer Jim Johnson (Mahershala Ali). It just goes to show that even the “good guys,” when doubtful, can play a part in hindering success. There’s a lesson that comes with this: when you’re smart, and you know you’re smart, you can really only trust yourself. And that is exactly what the women of Hidden Figures do. The hope that these women see and stick with is well-executed by co-writer and director Theodore Melfi’s vision, which involves more than plain drama. With a touch of light comedy and a heavy dose of distinctive style, Melfi adds a certain groovy excitement that space films don’t typically have (thanks, Gary Sinise). You know you’re getting the best of both worlds when a film features music by Hans Zimmer and Pharrell. The drama and the groove of the film are both displayed most prominently in scenes outside of the office. Quiet moments of humanity sprinkled in-between the work grind give the audience that buttery “oh yeah, this is lovely” feeling. My favorite moment, however, actually happens within the workplace, when Mary Jackson (Janelle Monáe) is assisting the engineering team of Karl Zielinski (inspiringly played by Olek Krupa). When she doubts herself, telling her mentor she’s “not gonna entertain the impossible,” he reminds her that they are both outsiders. He’s a “Polish Jew whose parents died in a Nazi prison camp,” and both he and Jackson are already “living the impossible.” This exchange exemplifies the most relevant quality of Hidden Figures: it’s a full-fledged American film. People from all backgrounds come together for the common cause of pursuing the American Dream. Borders are broken to make it happen. The status quo is slowly chipped away at. As Katherine Goble, Taraji P. Henson delivers a career highlight moment: a groundbreaking speech in which she speaks out about the ridiculousness of colored restrooms and the struggle she has working in the office that white people have no experience dealing with. However, Monae is the standout player as her portrayal of Mary Jackson is unwaveringly gripping. You cheer for her. She is the comic and the genius of the story. 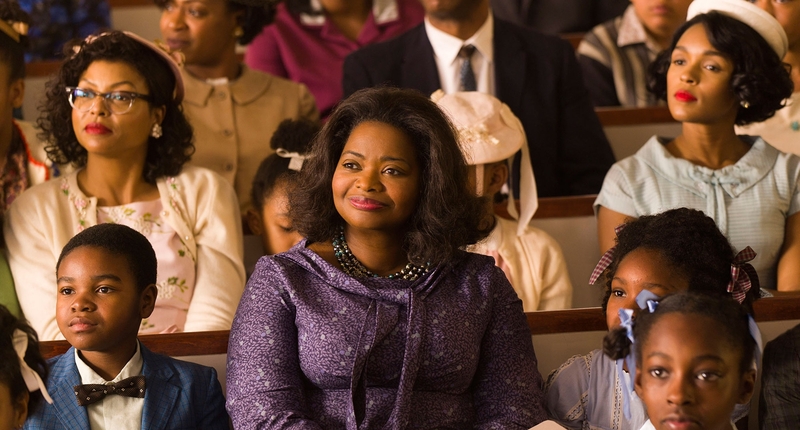 Simply put, her role in Hidden Figures, and her recent role in Moonlight, solidify her as a well-rounded actress who can do both comedy and drama with ease. Indeed, the three main actors bring powerful performances. Additionally, Jim Parsons plays Stafford, an established mathematician Katherine is assigned to check the work of. Though he plays the part moderately convincingly, he comes off a bit whiny at times and becomes a headache. Kevin Costner makes for a great mentor who is built up to be intense and unapologetic but turns out to be an honorable man with a grand vision for the U.S.
A smooth effortlessness pulses throughout Hidden Figures, making it consistently enjoyable to watch. Maybe it’s a side effect of the exact opposite displayed in the characters’ inspiring effort and immense focus. Tags: Jake Triola. Bookmark the permalink.